A lot of crime writers will do two or even more different series at the same time or in sequence (a trilogy followed by another trilogy, or whatever), but I have seldom read a second series that is so different from the first as is the case with John McFetridge's previous Toronto novels and his new series based in Montreal (Black Rock, from ECW publishers). 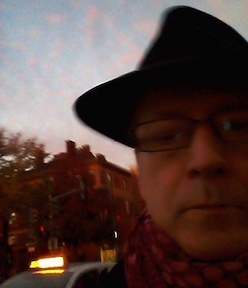 To make a comparison (always dangerous) he has shifted from Elmore Leonard's territory to Joseph Wambaugh's. What the series do have in common is one factor that both those classic crime writers share: the ordinariness or "dailiness" of the stories. McFetridge's Toronto novels (there are four, I think) are present-day, and the arc of the story tells the tale of Montreal biker gangs that have shifted to Toronto to take over organized crime there from (in part) the Italian mob from south of the border. The stories frequently shift focus among a number of characters and the plots take unexpected turns in the way that life does. There is a dark, wry comedy to the novels, in the twistiness of the plots, the concrete and thoroughly believable dialogue and "real life" of the characters, and the sympathy that the author derives from the reader for some pretty unlikeable people. 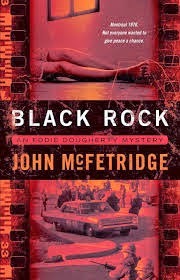 Black Rock (the title comes from a popular name for a monument to immigrants of a previous century) is set in 1970 in Montreal, a time of upheaval and unrest partly shared with the rest of Canada and with the U.S. and partly unique to the violent separatism in Québec at that time. There are so many bombings in the story (and in the memory of the characters) that the violence (or threat, since the bombers frequently warn the police) that they have become part of the daily routine. The central character, who, unlike in the author's previous novels, is the sole pair of eyes through which we see the story, is a beat cop rather than a detective. He is also an Anglophone, though raised in a Francophone neighborhood, and he is as isolated on the police force as he was in that neighborhood. His name is Eddie Dougherty, and one running bit of comedy is the butchery that the French speakers do with that Irish last name. But the conflict and mistrust among the divided communities is a very serious aspect of the story, as in real life. McFetridge's style is more straightforward in this series: though he sets out to tell the story of a cop's daily life in the way Wambaugh does, he avoids the intermittently hilarious style of some of the American writer's books. McFetridge seems to be involving the reader in Dougherty's life more directly, and perhaps for the long haul: the arc of this story is the young cop's journey from an outsider officer who goes where he's told to one whose determination and attention to detail will break cases. But McFetridge avoids a simplistic "rise to stardom" or Sherlockian insight and pat resolution of the story. Dougherty gets through to a truth, not the total solution to everything that's been going on. Amid the search for increasingly dangerous bombers, sucking in more and more of the police force's resources, Dougherty happens to be the first on the scene at the discovery of a murdered girl, a French speaking girl from his neighborhood. Officially and unofficially, Dougherty begins to work with an alcoholic but proficient detective on the notion that her murder isn't a one-off: there are aspects that suggest the work of a serial killer known to the police as "Bill." Along the way, Dougherty meets a graduate student researcher who's interested in the "Bill" case, but the young cop's involvement with her is as tentative and resistant to final resolution as aspects of the bomber and the murder investigations. The new and more serious and historical of McFetridge's series is ultimately as realistically unpredictable as his previous, more comic and current series: and as engaging as that earlier set of stories for the reader.